Auctioneer James Heaslip. Photo: Mike Shaughnessy. 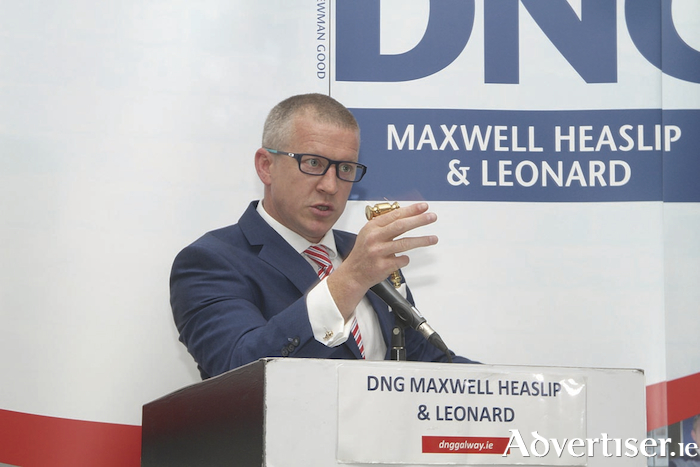 This day next week will see the auction team in DNG Maxwell Heaslip & Leonard hold the first of their summer 2018 auctions in the Galmont Hotel in Galway. Thursday May 10 will see a host of mixed residential units come to the auction floor with exceptional value across the board. This weekend will see the team hold the last of their Saturday open viewings, offering a final chance for buyers to see each of the lots before they go under the hammer. James Heaslip, who heads the auction team, said: “We have a good mix of high quality properties coming to the market and there is some fantastic value on offer. The whole team have been working hard to have the properties ready for the open viewings and we have already had large numbers through each property." A well-located parcel of land comprising c0.9 acre in a central location close to Oughterard town centre and the Owenriff River, in an area which is zoned Low Density Residential as per the most recent local area development plan. There are a number of one-off detached residences adjacent to the property, with a residential development adjoining the lands at the northern boundary. The land is accessed via a shared entrance from a secondary road from the N59. Close to all amenities and just a short drive to the centre of Oughterard. An outstanding one bedroom apartment in the much sought after Cois Cuain development adjacent to Grattan Beach on the immediate outskirts of Galway city centre and a five minute walk to Salthill. Located on the second floor of a modern apartment block, this bright and spacious unit offers c648sq ft of living space, a wonderful aspect, and views of Galway Bay, the Burren, and the Clare hills. Part of a fully managed secure development and with the benefit of basement storage, this well-proportioned apartment will appeal to both investors and owner occupiers, especially those who may be seeking to downsize. A spacious two bed, second floor apartment located in a modern development on the Headford Road within a few minutes' walk of the city centre, Galway Shopping Centre, and Galway Retail Park. Additionally, both NUIG and UHG are within a short stroll of the development. Extending to c667sq ft, the apartment benefits from a private balcony, a dual aspect, private secure parking, and a communal courtyard. An impressive two bed, first floor, apartment located on the Ballymoneen Road in Knocknacarra. Circa 829sq ft of living space, it is part of a private, modern, block of eight apartments and has the benefit of private parking and communal rear gardens. Conveniently located four bed semidetached property in the mature and very much sought after residential area known as Lifford, with all the conveniences of Ennis town centre on its doorstep. Extending to circa 1,400sq ft, the property offers many features, including a spacious hallway, large cosy living room, and a recently extended modern kitchen with extensive glazing to the rear overlooking a large site. Being sold with tenants in situ. Located in the ever-popular area of Corrib Park, this three-bedroom end terrace property offering c.969ft² of living space is a perfect opportunity for a first-time buyer or investor. In need of some refurbishment this home is just a very short walk from both NUI and UHG and has a host of facilities and amenities close by. The existing property has a ground floor living room, kitchen/diner, and solid fuel heating. There are three bedrooms overhead with the attic area converted to storage. The rear garden is fully enclosed with potential to extend. A fantastic four bed semidetached property located in the Tower Hill development in Ballymote. The property offers c1,120sq ft of living space and requires some modernisation. Within walking distance of the train station, shops, primary and secondary schools, and crèche. A wonderful two bedroom apartment in an award winning, O'Malley built, development on the eastern outskirts of Galway city. The Roscam development is located just off the Dublin road and is close to many amenities such as GMIT, the Galway Clinic, Merlin Park Hospital, and a number of business centres. With c775sq ft of bright spacious living accommodation, the apartment is being sold with vacant possession and includes parking. Galway city centre is just a 10 minute drive away. The subject holding is a parcel of land comprising c5.7 acres on the Letterkenny Road in Stranorlar, Co Donegal. Made up of three folios, the lands are adjacent to the town centre and may have future development potential, subject to planning permission. Folio nos DL61136F, DL20612, and DL11726F. The subject holding comprises approximately c11.7 acres of land in Dundee St Johnston, Co Donegal. Currently in use as agricultural land (good quality ) the land fronts on to the R236 Derry road. The land has excellent views overlooking the River Foyle and may be suitable for future development, subject to planning permission. A most impressive first floor one bedroom apartment in the stylish Croit na Mara complex in the centre of Salthill. Finished to an exceptional standard, this c570sq ft residence is in excellent condition and includes a host of features including porcelain tiled floors, a fully integrated kitchen, and a balcony with southeast views looking onto Grattan Beach. The auction will take place in the Galmont Hotel, Lough Atalia Road, Galway, on Thursday May 10 at 3pm. Full particulars on any of the properties are available by contacting any of the auction team in DNG Maxwell Heaslip & Leonard at 091 565261.